The ‘Institute for creative Technologies’ at the University of California, has produced a film in order to set the marbles at the British Museum in context. 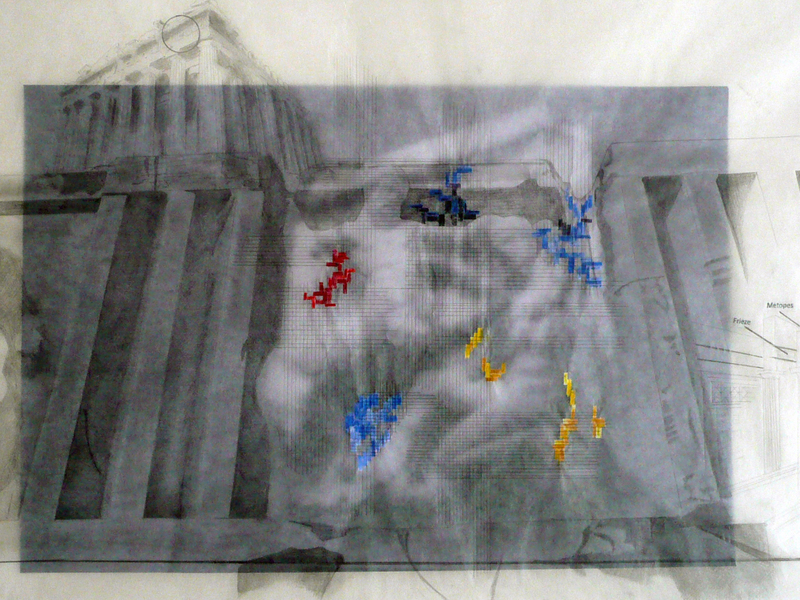 ‘The Parthenon’ as the animation is called, goes through a fly-walk from the Parthenon building as it stands in Athens today, to the interior space of the Duveen in order to place the pieces of the museum at their original location, ending up with the whole Parthenon complex restored and painted. The animation was made with the use of 3D design at the computer. The marbles were originally scanned, taking into consideration the lighting conditions and the illumination of the marbles and then produced a series of shots which form the animation. Natural sunlight for the animation was captured in Southern California, at a latitude similar to Greece, yet at an unspoiled rural location.42 This animation gives very successfully a sense of what is standing behind the isolated exhibition of the British Museum, and gives a new dimensionality to the decorative marbles of the Parthenon. It is here that the question of giving a spatial dimension to this animation arises. Here a more personal and dynamic experience at the Duveen Gallery is proposed, where contextual information similar to those of ‘The Parthenon’ animation can be projected in space and provide a more meaningful visit at the museum. In order to achieve that, technology will be introduced into the gallery which will work in relation to the visitors’ body behavior. The technology that is required can be separated in three main parts. The one which recognizes the visitors’ position and movement, the projections that respond to the visitor and the main computer devices that interact between these two. By employing technology, like projections and by capturing the visitors’ position in space, a responsive real time guide will visually inform the visitor about the missing context of the marble he is looking at. The aim is to create a rich informational environment, where the visitor will be attracted by a pleasant and effective presentation of information about all the historical and architectural information that surround the Parthenon marbles and are currently not transmitted to the public. The behavior of people in the gallery will enable or disable video projections which will take place on the actual exhibits and on the walls that surround them.